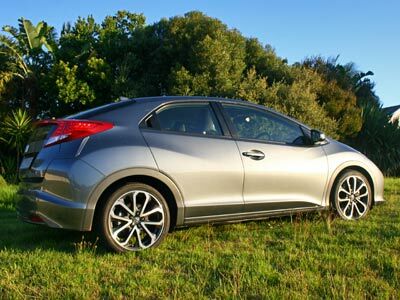 The top of the range Honda Civic is sublime. I admit I am slightly biased toward Honda. But still. This turbo charged diesel does it for me. It is a normal useful everyday car on the one hand and it is a performance boy racer on the other just champing at the bit. Unleash it and you unlock automotive bliss. If you have the extra cash and you want a pocket rocket on occasion but a civilised car the rest of the time this Civic will deliver. I loved it. Many members of the public and friends spontaneously commented on the car’s good looks. The guys liked the rims too. So take it from us. She is a looker. The lines and dimensions gel. She looks right. Honda Civic showing off her flowing lines. But how does she go? I got 5.7l/100km on average for the week she was with me. During the car’s week I drove her she rode up parking garages, pulled away in little acceleration tests and topped 180km/h. I am confident you will achieve sub 6l/100km figures. Acceleration, even in fifth is good enough to overtake on the open road in normal conditions. In lower gears the torque is very satisfying. Thank you. The torque maxes out at 300Nm, and with the relatively light body you can imagine the pulling power of this 1.6 turbo diesel. I topped 180km/h without trying. The brakes, steering, road feel all result in a true driving experience. Man, it’s fun to drive. After you get used to the slit dash, the interior of this car impresses with its well considered layout and clever use of space. With the rear seats down you get 1200litres packing space and boot only is 467 litres. The rear seats can be tipped up cinema style to form a second storage area in the rear cabin. They also have a one-motion, dive-down feature (split 60:40) to create a flat loading space. This is a luxury car and comes with all the expected goodies. The comments I got were overwhelmingly positive. 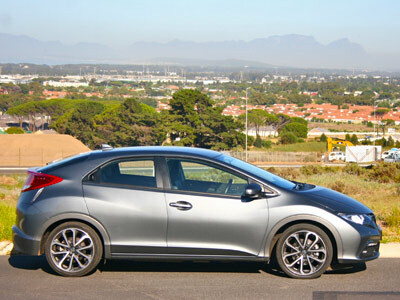 The Dtec Civic is very much a driver’s car. Awesome acceleration, great road holding and brilliant handling. The Civic looks like a hot two door sports hatch. It is hot and it is sporty, but it is actually a four door and very practical. Price as tested is R324 500. The 1.8i Elegance costs R270 500 or R284 600 in automatic, the executive R24 000 more. Also look at the Golf GTi, Opel Astra Sport, Renault Megane, Ford Focus. Warranty is 3 years or 100 000km while the service plan is for 5 years or 90 000 km. 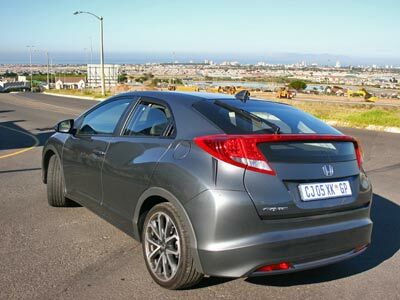 This entry was posted in Reviews and tagged Civic, diesel, honda, Review, South Africa, turbo. Bookmark the permalink.